Everyone has germs. Our bodies are covered with germs that help us stay healthy. In addition to the germs that are usually present on our skin, we also pick up germs from contact with other people or objects in our surroundings. These germs are easy to pick up and transfer. In this way, they can cause you, or others, to get sick. Although people usually think that germs are spread through the air, the fact is that germs are most easily spread through hand contact. 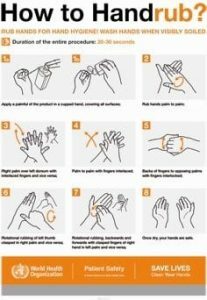 One of the best ways to stop the spread of germs is to wash OR decontaminate your hands. 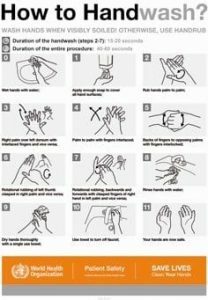 Hand hygiene is a new term to describe washing or decontaminating hands. Washing hands helps to physically remove germs by friction, and to rinse them down the drain. Decontaminating hands reduces the amount of germs present on hands through the use of special alcohol based preparations, in the form of solutions, gels or foams. While alcohol based preparations reduce the germs on your hands, they cannot remove visible soil or contamination. It is always important to WASH hands with soap and water any time they are visibly dirty. When should you wash your hands with soap and water? When can you use alcohol based hand rubs?